Luxembourg was the founding place of the first post-1945 supranational organisation in Europe. The European Coal and Steel Community (with France, Germany, the Benelux states and Italy) was the basis from which the European Union grew and it was bound up with hopes of enduring peace and economic, social and cultural cooperation. The starting point for the artist’s installation is a research about four over-painted windows in the Great Hall of the Casino Luxembourg. These are apparently connected to the interpreter cabins for the first international meeting that no longer exist. 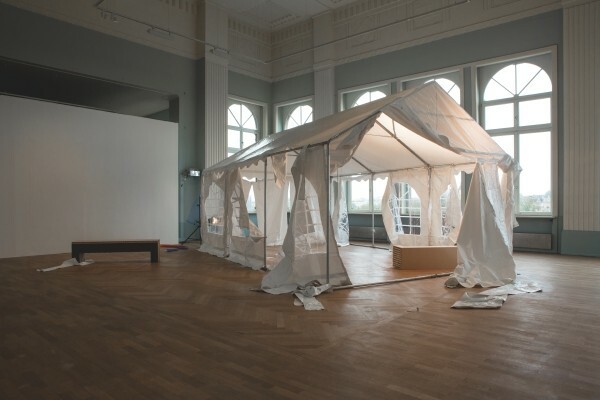 Seen from today’s point of view and a political and economic situation of permanent crisis, the installation attempts to envision the utopian potential of those foundation years as well as stage a critical commentary. Who has the say? What is at risk? How do we view the future? Qui parle? Wer spricht? Wie schwätzt? Chi parla? Thanks to: Franz Alexejew, Sandra Kolten, ­Jo Kox, Stéphanie Majerus, Kevin Muhlen, Firma Néon Muller, Susanne Neuburger, Patrick Scholtes, Angelo Stagno, Eva Dertschei.